Some things you just can't cheat on. Your toddler will always know when you are trying to sneak some chocolate out of the pantry no matter how hard you try to distract her with balloons or bubbles. Your husband will always notice when you use ground turkey instead of ground beef, even though you swear you can't tell the difference yourself. (How can he tell under all those seasonings and tomato sauce?). There is no substitute for rising time with yeast dough, and frozen, mashed bananas will never be ice cream. Risotto, though. You can cheat on risotto. Yes, it is supposed to be stirred, stirred, stirred and develop a creamy texture from that process, but you can get some pretty good risotto with other methods that are way, way, way easier. Using the pressure cooker is one way I've posted on before, but this version might be even simpler. It is just baked. Seriously. You bring the rice and water to a boil, then stick it in the oven so it cooks the rest of the way at a very low simmer. You still get a creamy dish and your arms will thank you. 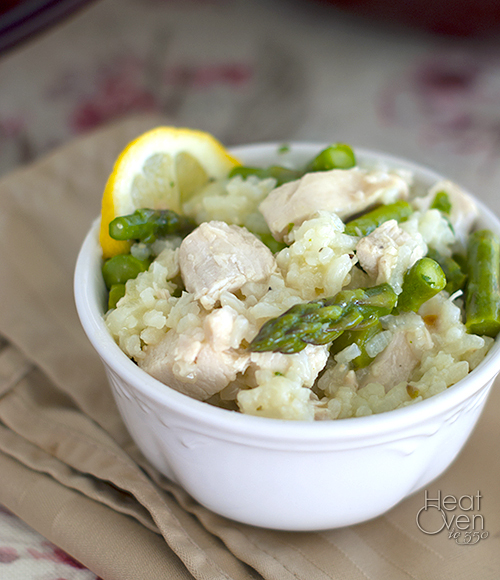 The flavors of this baked risotto make it a favorite of mine in the spring. They are so simple, but bright and fresh tasting. 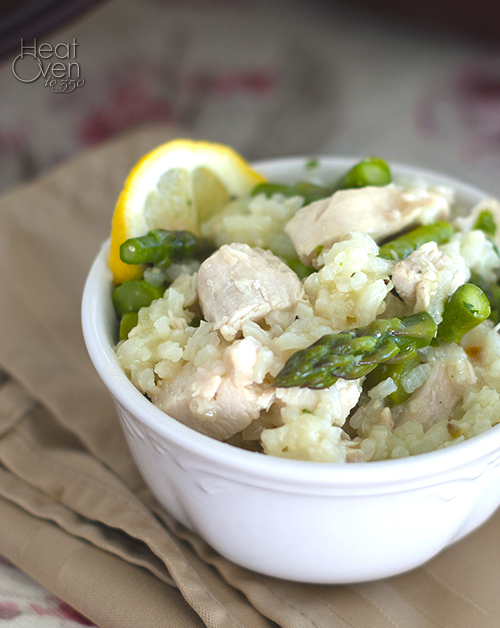 Creamy rice meets chicken, asparagus, basil, Parmesan and lemon. That's a happy flavor party in my opinion. It's one of my favorite ways to sneak asparagus into a main dish instead of always serving it on the side, and the fact that it makes a lot doesn't hurt since leftovers are my hero. If you've wanted to cook risotto at home but were intimidated by the process, this baked version would be a great way to try. Heat oven to 425 degrees. In a Dutch over over medium heat, melt butter. Add onion and garlic and cook until softened, about 5 minutes. Add rice and cook and stir 2 min or until rice begins to brown. Stir in chicken broth, bring to a boil, then cover and transfer to oven. Bake for 20 minutes. Remove dutch oven from the oven and stir in the chopped asparagus and cooked chicken. If risotto is starting to look dry, add 1/4 cup more chicken broth. Cover again and return to the oven for 10 minutes. After removing Dutch oven from the oven, let stand 5 minutes. Stir in 2T of the lemon juice, the basil and the Parmesan. Stir until Parmesan has melted. Season with additional lemon juice and salt to taste. Serve. Baked risotto? I definitely have to try this! I love risotto and would much rather just let it sit in the oven and cook than stir it. Thanks for the tip!